ESXi is free… but, why do you buy ESXi anyway? ESXi is often told to be a free hypervisor. I’ve mentioned in my previous post that there are actually two free ESXi versions: Evaluation and Free. The thing is, both have several limitations that make them unfit for production use. The former has a 60-day time limit, but it provides all the ESXi features. The latter, in its turn, has no time limits, but it lacks many cool hypervisor features. With all that being said, it becomes clear why you just buy from VMware at some point even though you are potentially good to go with any of those free licenses. The good thing is, VMware are very loyal in ESXi licensing. Well, you won’t get a rich set of hypervisor features in a free version, of course; but you, at least, don’t need to pay for its deployment in your home lab! 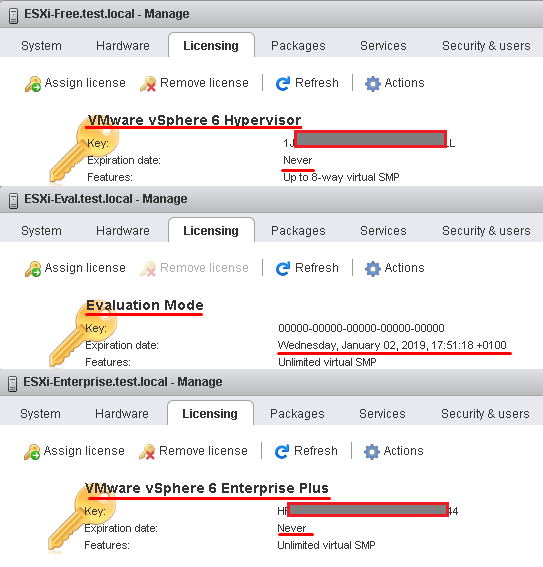 In this article, I compare both free VMware ESXi 6.7 Update 1 (I refer it as ESXi below) licenses and Enterprise Plus. I think this post may be interesting for guys who have just started running their home labs or are getting familiar with VMware vSphere. VMware Free is 100% free just as it comes from the version name. Register at VMware website, download the hypervisor, request the key, and you are good to go! What’s the catch? You get ESXi for free for the unlimited time… however, it has a pretty poor set of features. VMware Evaluation features all ESXi functions, but it goes off in 60 days. Once the timer stops, you won’t do anything in vCenter Server. VMs will keep on working like clockwork, but once you shut down any of them, you’ll never start it again until you either buy a commercial version or switch to Free. 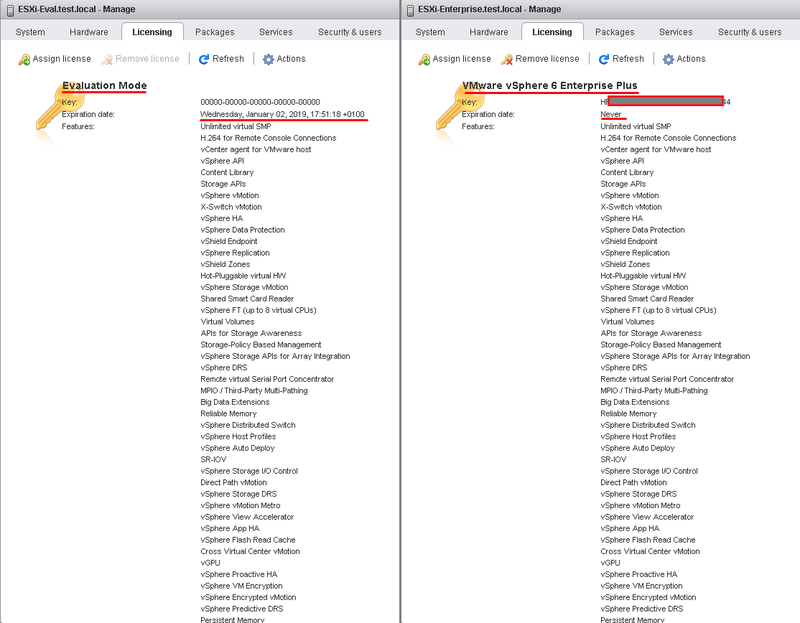 Enterprise Plus is the top-notch ESXi version. 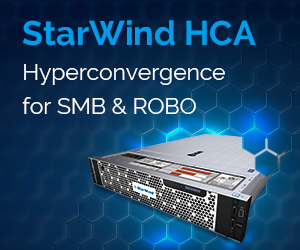 It is a commercial edition, so it has no time restrictions and provides you all the robust hypervisor features. 4 x 1 Gb/s LAN. All three servers were under ESXi 6.7.0, 10302608 orchestration. The name of each server corresponded ESXi version on top of it. Afterward, go to the Licensing tab to find out about limitations. Here’s what you see at that tab in ESXi Free. It does not have many cool features, though it is free and never expires. Below find what you typically see at the Licensing tab of ESXi Evaluation and Enterprise versions. As you can see, the only difference is that Evaluation license expires one day, while Enterprise Plus lasts forever (to be exact, until your ESXi version is supported). Regarding all known limitations of Free, Evaluation and Enterprise versions that are typical for older ESXi versions, I decided to figure out whether they are still there. Here is the table with limitations that I tried to reveal in ESXi 6.7. Now, let’s get some more details. Just as any previous ESXi version, ESXi 6.7 has memory restriction. Interstingly, if you have over 32 GB of RAM in your host, there will be no memory limitations after all! The screenshot below had been taken on the host with 128 GB of RAM. As you can see, I can use all of it. Even though many claim ESXi to be simple, it still can be quirky. With the Free version, you won’t be able to talk to VMware support. You still can look through VMware communities, and, if you are lucky enough, you may find the solution. Besides, you should agree that it’s always better when the solution is backed up by the guys from support. You won’t be able to add hosts to vCenter and manage them via vCenter if you go with the Free version or after Elevation expires. If you a stubborn one and try to add hosts in vCenter anyway, you’ll encounter an error or will be asked to purchase a proper license. Here’s the error message that I was talking about. Quick reminder: Two hosts below have Enterprise Plus and active Evaluation versions installed. Evaluation is the only ESXi license with limited in time. Once you install it, you can benefit from the unlimited ESXi features for 60 days. Once time ticks down, you are to either extend the license or switch to Free. The nice thing is, you can always switch to Evaluation from any other license including Free. Of course, once you have run out of time, no magic happens if you switch to Free and back. You won’t have 60-day trial again unless you re-install ESXi. Other two versions that I review here do not have any time restrictions; until they are officially supported, you are good to go. Well, that is the constraint that I can only mention, but, unfortunately, I could not check it here due to my hardware limitations. I also did not find any official information saying that this limitation persists in ESXi 6.7. If you know anything on this matter, please, share it in comments. ESXi Free allows using just 2 CPU sockets per-host. Well, my servers even don’t have more. So, I cannot say whether they are still limited. With Evaluation or Enterprise plus, you can assign up to 128 vCPUs per-VM. 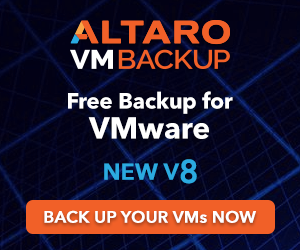 For the Free version, you need to go with not more than 8 vCPUs in one VM. Interestingly, in the Free version, you still can create a VM with just as many vCPUs as your host has logical cores. However, you won’t be able to start it just like any other VM that has over 8 vCPUs. Here’s the message you’ll see if you try to start such VM. Well, you cannot do much about this situation, so either run VMs with 8 vCPUs or update your ESXi license. 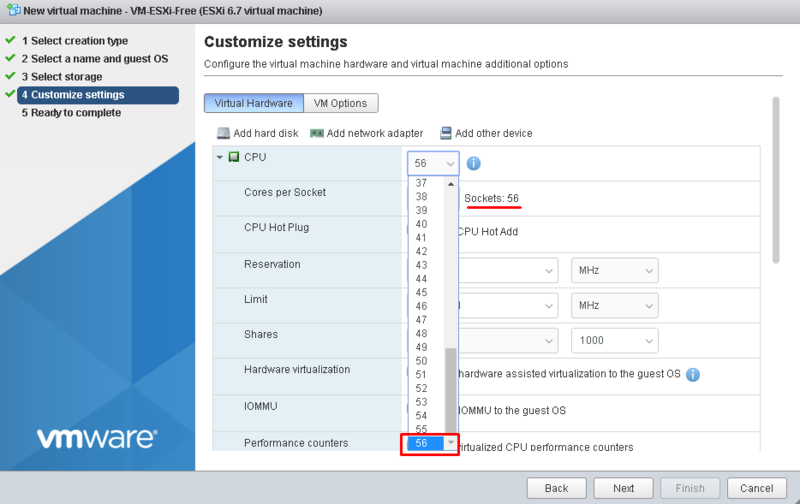 In ESXi Free, users need to go with the limited set of API features. 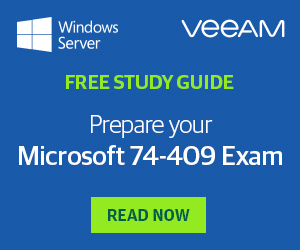 In other words, the hypervisor won’t be able to interact with other third-party applications like Veeam Backup & Replication 9.5. Being unable to use neither vCenter nor APIs, you have no other choice than to buy an advanced license. 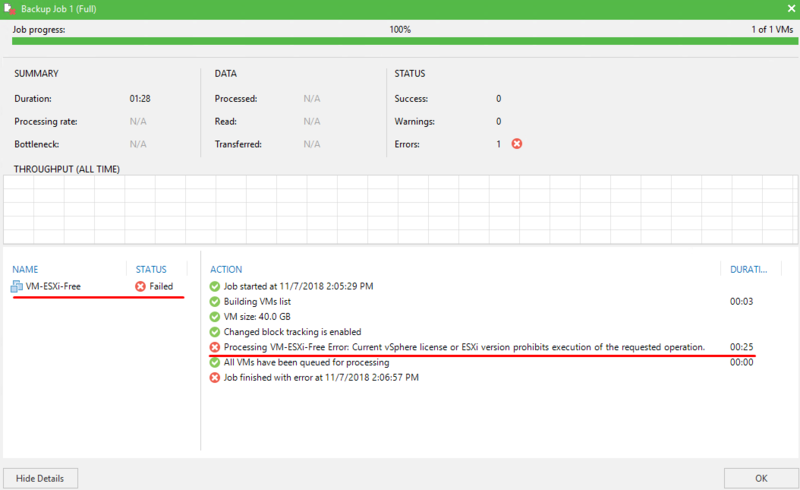 Here’s the message you get once prompted to back up with Veeam Backup & Replication. In this article, I took a closer look at limitations of ESXi 6.7 U1 licenses. Everything seems to look just as it was before. Based on this, ESXi Free still seems to be great for home labs regardless of its limitations. Evaluation, in its turn, allows getting familiar with all ESXi features. I think 60 days is enough to let you love the hypervisor. I hope that this small review makes you love the hypervisor too.